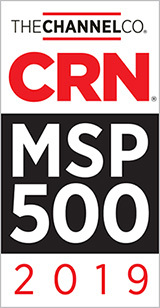 We are pleased to announce that CRN®, a brand of The Channel Company, has named Frontier IT to its 2019 Managed Service Provider (MSP) 500 list in the Pioneer 250 category. Companies chosen to be recognized by CRN are among the top technology providers in North America. Frontier IT provides a host of advanced IT services including; cloud data protection, cyber security, employee support, and network engineering. We hold several compliance certifications including HIPAA, PCI DDS, and SSAE18 This rigorous audits are performed annually by a third-party to verify our policies and procedures are strictly adhered to. If you are not getting the results out of your current IT service provider, contact us today. Frontier IT is ready to change the way you view your IT partner forever. Frontier IT is a Colorado based B2B managed IT services provider trusted by hundreds of customers and their employees throughout the front range. We provide a powerhouse of technical capacity and experience to our customers that outsource their mission-critical IT requirements. Our staff’s aptitude for technical support is unsurpassed with capabilities unequaled by competing IT firms. We will change the way you view your IT partner forever.